Oh, my lovely Melfka, what would I do without your recommendations? Seven pilgrims – a Poet, a Soldier, a Detective, a Priest and a Consul among them- are going to meet a deity called Shrike. Shrike is supposed to be the Lord of Pain and everybody fears him. Still none of the pilgrims actually believe in him or worship him at all. They have been chosen by an entity called Technocore to undertake the last pilgrimage for quite obscure reasons. All of them have had interesting lives. During the long journey to Tombs of Time they tell the rest about their trials and tribulations. The Canterbury Tales by Chaucer? Decameron by Boccaccio? No, a sci-fi novel which clearly was inspired by them. Add to that John Keats, a 19th century English poet who, among other things, wrote Hyperion, an epic poem based on Titanomachia, and added the term “negative capability” to theory of literature. Oh, and he died of tuberculosis at a tender age of 26 in Rome, mourned by at least two ladies who had been in love with him. If you think that strange mixture fits a sci-fi story awkwardly at best then think again. I’ve already praised Simmons for a very clever way he weaved the narration of Ilium and Olympus, adding both technical terms and notions to perfectly humanistic bits straight from history of literature. In Hyperion he did the same – but with a greater skill. I did love the fact that the book was actually composed of six novellas, held together by the pilgrimage trope. Among them I liked the sad story of Martin Silenus, a poet who had it all and then was abandoned by his muse, the best. The second best was the family drama of Sol and Sarai Weintraub whose only daughter, a young archeologist, got mysteriously ill. Then I have to admit I read the tale of Brawne Lamia (Brawne! One of Keat’s beloved ones was called Fanny Brawne! ), a private detective who found love in a very strange place (but taking a very lovely form nevertheless) with real interest. Everything was more or less interesting here. Still I didn’t like the fact that the book ends with a big, fat cliffhanger which forces me to read on. And read I will. Dan Simmons writes sci – fi books like no other author. Accept it as a fact of life. 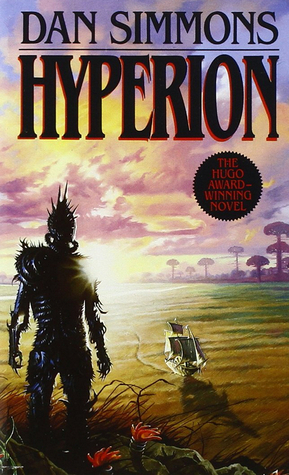 This entry was posted in book review, dystopia, fantasy, one brilliant book, philosophical, religious, romance, sci-fi and tagged classic sci-fi, dan simmons, great plot, hyperion, john keats, one brilliant book, that's how it should be done. Bookmark the permalink. Oh good! I am so looking forward to your review now! *doing a happy dance* thank you! You are on a Dan Simmons kick! Oh yes, I am – the discovery of the year! Ooooh. I’ve not read any of these books. But dang! Sounds like I need them. Great review! Thank you, thank you, oh Gracious One! I will certainly spread the love for Hyperion, me and my children and my grandchildren forever!